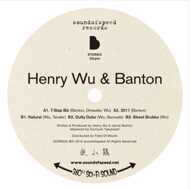 Man of the moment, south London's very own Henry Wu takes a break from Yussef Kamaal duties and joins up with fellow south Londoner 'Banton' for a collobartive EP on Japanese label 'Sound Of Speed'. There's no messing around here, this is straight up broken-beat fire! The EP includes a long awaited vinyl release for 'Natural' featuring a tidy vocal from Tenderlonious. This will fly, you know the drill!